The rain hasn't stopped people from making the trip to the small town of Kennebunkport, Maine to pay their respects to George H.W. Bush. 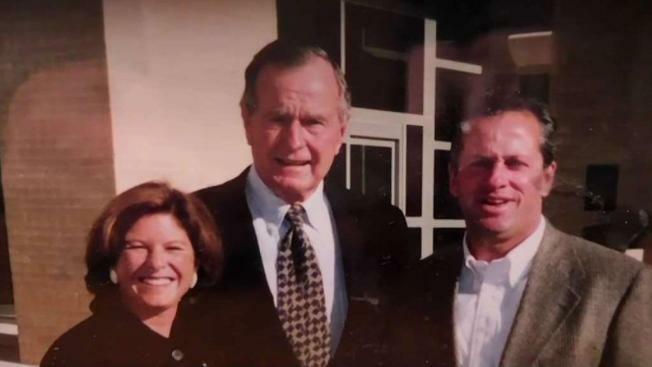 "I think it's just important that we recognize everything that he did," Kim Sullivan, who visited the memorial to Bush, said. Sullivan is just one of many people who have stopped by the memorial outside of the Walker's Point compound where Bush spent many of his summers. Some came to say a prayer. A memorial with flags and flowers continues to grow. "The spirit's out there. That makes this very nice," Frankic Krevosky said. And others came to show how much they loved the 41st President of the United States. "It just doesn't feel the same. He was a rock there. It felt like we were protected," Jan Fitzpatrick, a Kennebunkport resident, said. She lives around the corner from the compound and knew the former president and his wife Barbara not only as neighbors, but also as friends. "They'd always say, 'Oh, Jan. Of course we remember you,'" she said. "They gave and they gave and they gave, and we have to just take that with us." Fitzpatrick is going to Washington, D.C. for the state funeral. "He gave you a life lesson every time you were with him, and Barbara, too. Every time I learned something from then, and I hope to carry it with me for the rest of my life," she said. Down the road at Saint Ann's Episcopal Church, where Bush attended services, people visited to sign the guest book. "I just wanted to stop by and, as I said, say a prayer of gratitude," Susan O'Neil, a Kennebunkport resident, said. She says she remembers standing just feet away from Bush. "It was just a thrill to see the whole family here and the joy they took in the church," O'Neil said. The death of Bush coincides with the town's Christmas Prelude festival. The weekend, which is usually one of celebrating, has turned into a time of mourning. On Facebook, the Town of Kennebunkport posted that they lowered the American flag to half staff just hours after lighting the Christmas tree Friday night. "The town will never be the same," said Jared Guy, an officer with the Kennebunkport Police Department. He said new hires at the department were regularly invited to visit Walker's Point and meet with the president. Guy said Bush would meet with the officers, wish them well in their service to the community, and take photos. Thousands of visitors are in the coastal Maine town for Prelude, and many of them are taking time to stop by Walker's Point and pay respects to the former president. Some visitors said the president's death has changed the mood of the festivities. "He was a big part of this little town," said Rose Cozetti, visiting from New York. "I'm sure with the passing of his wife, he wanted to be with her. It's been a big year of losses, and we will always continue our traditions and remember the ones who are not with us anymore."